This Russian-manufactured 7.62x39mm ammo is perfect for long days on the range with your AK-47. 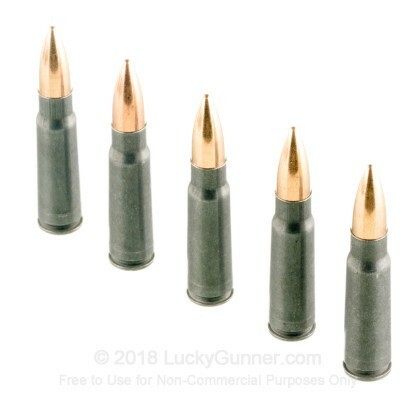 These inexpensive steel-cased cartridges feature 122 grain full metal jacket (FMJ) bullets that leave the muzzle at approximately 2330 fps with 1471 ft/lbs of energy. The bullets have steel-free brass jackets that are harder than standard copper jackets. 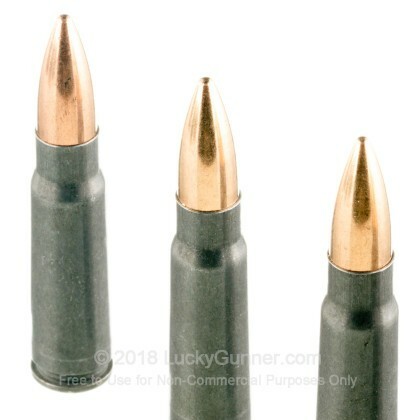 This ammunition is non-magnetic, so you should be free to use these rounds at many ranges where bi-metal jackets are not allowed. Tula utilizes Berdan primers in these new-production steel casings. These casings are not reloadable, but the low cost per round easily compensates for lack of reusability. If you are concerned about the long-term storage capability of this ammo, each steel casing is sealed with a polymer coating to prevent corrosion. Since 1880, Tula has been one of Russia's most respected ammunition manufacturers. They have found a way to combine moderately priced materials to create consistent ammunition that is available at an incredible value. 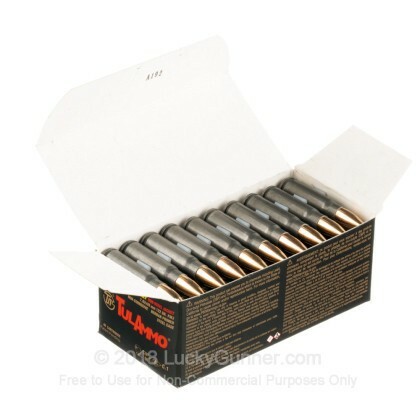 Order your 1000-round bulk case of this 7.62x39mm ammo today! With my AK47, I was able to repeatedly hit 300 yard targets with iron sights, so accuracy was very good for steel case. I had no malfunctions of any kind after 160 rounds, so reliability was excellent. As for quality, I did have a few rounds which had light corrosion on the steel casing. Price was great at around 24 cents a round. Overall I am very happy with my purchase and would buy again. Q: Will the cartridge attract a magnet? At my range, they simply pass a magnet over the ammo, if it attracts, it is a no go. A: Hi John! Thank you for your question. The "magnet test" has been an issue the entire country has to contend with to some extent and it's no fun being told you can't use your ammo. These Brass Jacket rounds by Tula use only a lead core and a copper jacket, so the projectiles themselves will not attract a magnet. However, depending on the standards at your range and the strength of the magnet used, the steel case that these are loaded into will attract a magnet. If they are imprecise or use an overly powerful magnet it is possible they may get a false positive, so we encourage you to check with your local range first before pulling the trigger on any questionable rounds. 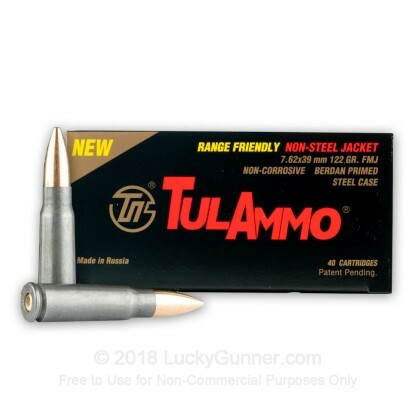 The good news is that these function as well or better than the standard Tula ammunition, so as long as you can clear the gates, you should have a great time at the range! A: The case of the ammo is steel, however the jacket of the bullet is a non magnetic brass. 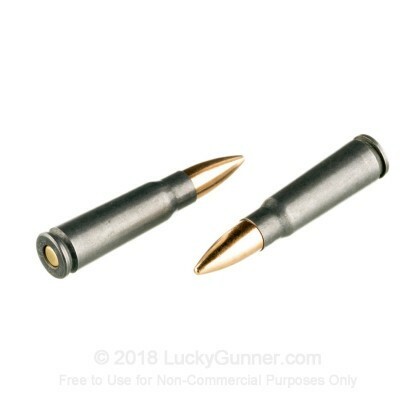 These are ideal for many indoor ranges where they do not allow traditional bi-metal jacketed bullets where the jacket is a copper-steel mix and therefore attracts a magnet. 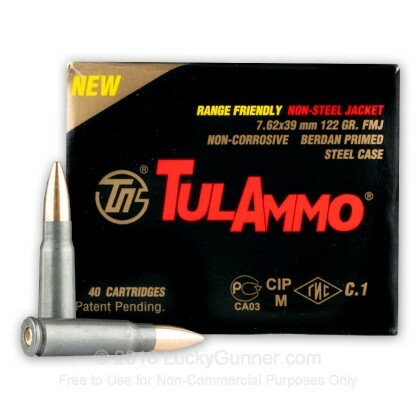 We also have this 7.62x39mm - 122 Grain FMJ Brass Jacket - Tula - 40 Rounds ammo in stock in a smaller quantity.